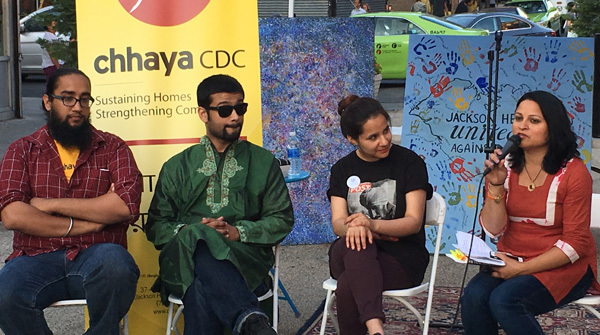 Jackson Heights, New York – June 27, 2016 – Chhaya CDC and community partners stood #UnitedAgainstHate in a large scale community event in collaboration with the Queens Museum on Saturday, June 25, 2016. In light of the heightened political rhetoric and hate crimes against the Muslim, Arab, and South Asian communities (MASA) and other marginalized groups such as the LGBTQ community. 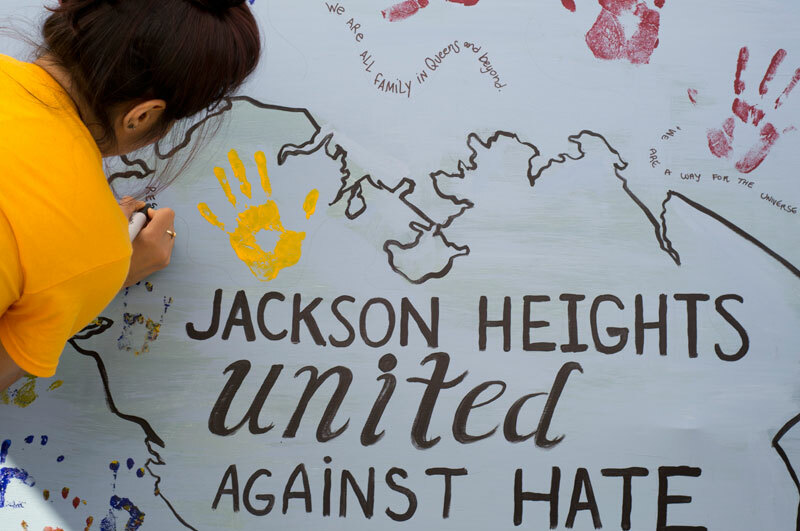 The event entitled An Evening of Rights and Reflections was held in the immigrant dense neighborhood of Jackson Heights, in Diversity Plaza. Attended by over 100 community members, the event brought together community members and activists who shared their experiences with discrimination through spoken word, personal reflections, and a community art project. Hate crimes against MASA communities have consistently been five times higher than pre-9/11 averages and have surged in the wake of the Paris and San Bernardino shootings. Most recently, Mohamed Rasheed Khan was knocked off his bike outside of a Center for Islamic Studies in Jamaica on June 5th, resulting in broken bones to his face and ribs. In April, a 19 year old was beaten in Astoria by three men as they yelled “ISIS.” The number of documented hate crimes is an outrage. More distressing is that many more acts of discrimination against individuals from marginalized communities go unreported every day. Attendees were invited to join in a collaborative art project to symbolically pledge their commitment to come together in the face of hate and discrimination. “At a time when our communities are transforming demographically and when we are facing a tremendous erosion of civil rights, as well as increased anti-Muslim and anti-immigrant sentiment, it is important that we have spaces and opportunities to build communities together. Hosting this event right in the center of Jackson Heights, one of the most diverse neighborhoods in the country, is critical because it reminds of us of what we have in common and that we have to be united in the struggle for social change. Deepa Iyer (right) moderates a discussion panel with community activists (from right to left) Jaspreet Kaur, Staff Attorney at United Sikhs, Naved Husain, Community Organizer at CAAAV, and Jagpreet Singh, Community Organizer at Chhaya CDC. In the wake of the massacre in Orlando, an event like this is so important to have right here in Diversity Plaza. We keep hearing messages that are dividing our country from political. And yet, living in this community, we know that it is possible that we can all live together in peace and harmony. The uptick in racial and religious discrimination has been fueled, in part, by commentaries from leading presidential candidates who have negatively portrayed immigrant communities including Muslims and Latinos. These controversial statements incite hate and promote xenophobia, using fear tactics that equate immigrants with issues of economic and national security for political gain. However, studies show that immigrants make significant contributions to our economy while nearly 62% of mass shootings since 1982 have been committed by white males. As a society, it is important to recognize that it the differences between our communities that have strengthened this nation’s global position. Diversity has been the key to innovation by bringing together different perspectives and experiences to create something new and unique. We must therefore embrace our differences and come together as one community, rather than exclude those that do not reflect our respective cultures, religions, race, or gender identity. As a community, it is imperative that we unite and stand up against hate.